ati = the prince ? ​nb ḤH xnt Imntt iry Dt = Lord of eternity, foremost Amentet maker of everlasting. ni-aHa-Hr-nst-m-xmt.s = Without consent no king ascends the throne ? My heart is mine, and is content with me. on that left side of the Basin. A khukhet-boat is faring north, another faring south. I can never fall down into the khukhet-boat that holds you. my arms for overthrowing my enemies. at the gates of the west for ever and eternity. in the reed field of peace may I receive cakes before thee. and the damned of the Underworld. duau Ausir/ Wesir neb djedta Un-nefer, Horu of the double horizon, many forms of existence, mighty of shapes. 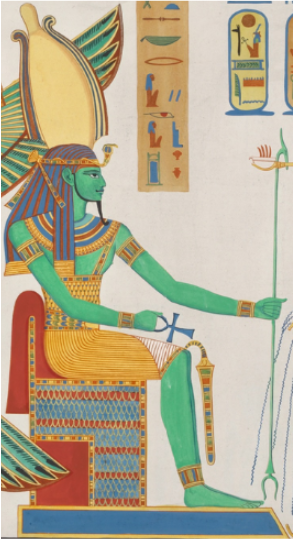 Adoration of Ausir/ Wesir/ Osiris, the lord of eternity, Un-nefer, Horu/Horus of the double horizon, many of forms of existence, mighty of shapes. O Bull of the West, says Thoth, King of Eternity. I am of your flock, Osiris. and repelling those who rebel against him. I have travelled at your name. on that day of judgement in the Great Temple of the Official which is in Iunu. I am the man of Djedu who is in Djedu. the women who lament Osiris at the Two Riverbanks of the Washermen. said Ra to Thoth. Thoth, have done. so he said as I, Thoth, have done. secrets of the mouth of the secret ones in Rosetau. I go in and out of the devouring fire on the day of repelling the rebels from Khem. of making the offerings to Ra on the day 6 and half-month festivals in Iunu. I am the pure-priest in Djedu, raising he who is in the mound. I am the god's servant in Abydos on the day of raising of the land. I am the one who sees the secrets in Rosetau. I am the one who recites the festival-book of the Ram in Djedet. I am the sem-priest in his task. I am the Greatest of Directors of Craftsmen the day of placing the Henu-bark on the sledge. I am the one who takes up the hoe on the day of hacking the earth in Nensu. so that it may sit as you sit. give bread at every occasion to my soul with you. without being blocked, without being turned back. its decision accomplished in the house of Osiris. the scales are free of its moment. I have brought you a djed-pillar of gold so that you may rejoice by it. 'Come, equipped spirit, and raise the Truth of the one who loves her'. I am equipped more than any spirit. ⲟⲩⲥⲓⲣⲓ ⲟⲩⲛⲟⲩϯ ϧⲉⲛ ⲡⲓϫⲓⲛϣⲉⲙϣⲓ `ⲛⲣⲉⲙⲛⲭⲏⲙⲓ ⲡⲉ. ⲟⲩⲥⲓⲣⲓ ⲡⲉ ⲡⲓⲓⲱⲧ `ⲛϩⲱⲣ.